So it seems that the mystery of who killed David Hanely is what will bring us to the end of season 2. I am just guessing here as I don’t know but it seems that Noah versus Lovand is over and the storyline around Shane rebuilding Millwood with his brewery is on the back burner. We open up at the motel with the police gathering evidence and Mercer and Owen going through what possibly happened. Milling around the motel are Shane and Taylor, who are/were guests. Joanna leaves Billy’s to identify her dad’s body and give a statement to the police. At the police station, Mercer asks Joanna who would have motive to kill her dad. Joanna mentions Ben Matheson as David threw him under the bus but Matheson has an alibi. Amy Carr, the woman who had punched Joanna in the face in season 1 is also brought in but she leaves as she knows the police have nothing to hold her. The mayor of Millwood is also questioned but she too has an alibi. 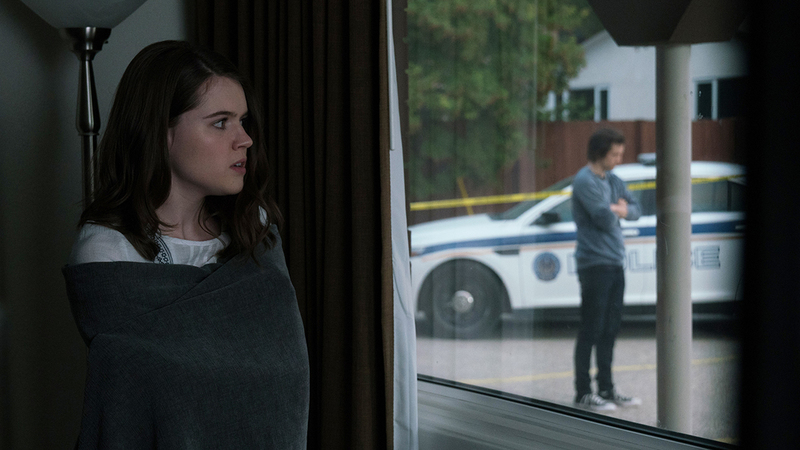 The mayor (and to a certain extent Owen) wants the RCMP to come in and investigate the murder as she feels that Mercer is not up to snuff but he refuses to let go of the investigation. Others that were at the motel are questioned. Shane is fidgety but says he did not kill David considering. Shane doesn’t clear things up and he too goes. Taylor is also interviewed and mentions hearing a man and woman argue next door but could not tell who they were. The pizza delivery guy that delivered Taylor’s pizza becomes a witness as we learn that he saw an Indigenous woman leave David’s motel room. Right away suspicion falls on Gerilynn because of the argument she had with David at the Boot that ended with her throwing a glass at this head. Gerilynn tells Mercer that why would she want to kill David as she filed a civil suit against him. Also, Gerilynn has an alibi that she was working all night and only took a 10 minute break. Mercer thinks all of that is flimsy and decides to hold her especially after the coroner report comes back that there was skin found under David’s nails. As they await for the DNA results, Gerilynn stays put. Billy pays Gerilynn a visit as her lawyer and gives her council. Billy also tells Gerilynn that Luna knows what is going on. Luna and Joanna meet at the police station where she lies to her and says she only arrived that morning with Taylor. Joanna goes to see Gerilynn on the pretence of being her lawyer. Gerilynn also professes her innocence to Joanna. Meanwhile, Billy sends Luna to his place where we find Shane checking it our listening devices. Shane hears someone in Billy’s garage and goes to investigate and finds Taylor rummaging through her stuff. Luna arrives and apologizes to Taylor for bailing but she says it is all okay and comforts her. Joanna goes back to the crime scene and breaks into her dad’s motel room. Joanna is careful not to leave any of her prints (yet her hair could drop anywhere) and discovers a motel towel missing and some blood near the mirror. Joanna calls Owen who is incensed that she could compromise a police investigation. But when Joanna points out the blood and how her dad would never use motel towels as he always brought with him his own monogram towels that Owen decides not to say anything. Billy too is none too pleased that Joanna broke into a crime scene but has good news that Gerilynn has an alibi and shows the $500,000 cheque that David wrote her. Billy and Joanna show the cheque to Mercer as proof as Gerilynn’s innocence as why would she kill a man and not cash his cheque. Plus, bar patrons can confirm that Gerilynn only took a 10 minute break. Mercer lets Gerilynn go but tells her not to skip town. After hearing that missed evidence was found at the crime scence, the mayor pretty much fires Mercer and brings in the RCMP to take over. Over drinks with Diane, Joanna learns from Billy that Taylor was a witness to her father’s murder and learns that Luna lied to her. Joanna rushes to Gerilynn’s place only to find mother and daughter ready to run. Joanna then sees that Luna has scratches on her. This forces Luna to say what happened that night. Joanna encourages Luna to turn herself in and running will only makes things worse and that if she does, she will be running for the rest of her life. Luna wants the night to think it over so Joanna sleeps on the couch. The next morning, Luna decides to go to the police to tell her story but the police arrive and arrest her for David’s murder as it seems that the DNA tests came back that points the finger at Luna. Luna uses her phone call to Molly but gets her voice mail. Earlier, Luna had been trying to reach Molly but kept on getting her voice mail. When Molly finally called back and learned everything she promised to be there for Luna. Yet in Luna’s darkest moment, Molly is nowhere to be found. But after Molly hears Luna’s voice mail, she immediately packs and heads to Millwood. Outside the police station, Billy vows to offer the best defence to help Luna. Joanna knows that there is an ethical balance with her defending Luna and also being the daughter of the victim. Before they proceed with a defence strategy, Joanna plays Billy a voice mail that Luna had left in episode 1 that threatening David because he got away with assaulting her mom. Joanna makes the decision to delete the voice mail. So should Joanna really defend her sister? I think she should not and actually bring in Teddy to help but I don’t think that will happen. And I am pretty sure that Shane did it in one of his schizophrenic episodes. It makes sense as how can a tiny woman like Luna have enough strength to land a fatal blow. But we will see.